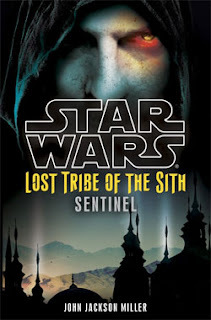 Faraway Press: The Online Home of John Jackson Miller: Lost Tribe of the Sith #6: Sentinel now online! The latest chapter of Star Wars: Lost Tribe of the Sith is now available for free download! Lost Tribe of the Sith #6: Sentinel picks up immediately where the previous chapter, Purgatory, left off — a first for this series. The one person on Kesh who knows who the Sith are and what danger they represent has just been discovered — by someone he thought he could trust! You can find the PDF at StarWars.com, and here is the link for earlier chapters. At Amazon, the Kindle download is now available; as in a previous occasion, they seem to have accidentally put a 99-cent price on it — I've let the folks in charge know, so that should soon be fixed. Meanwhile, here are the (free!) links for Barnes & Noble and the Sony eReader. I'll try to do the production notes for #5 and #6 simultaneously — although it should be pretty obvious that I'm behind on a lot of website stuff. They're on the list!